‘Bonjour’ is not how you expect to be greeted in Auckland, New Zealand – especially when you are not French, but it’s how staff welcome us to the Sofitel Auckland Viaduct Harbour (I’m presuming it’s a company-wide thing). 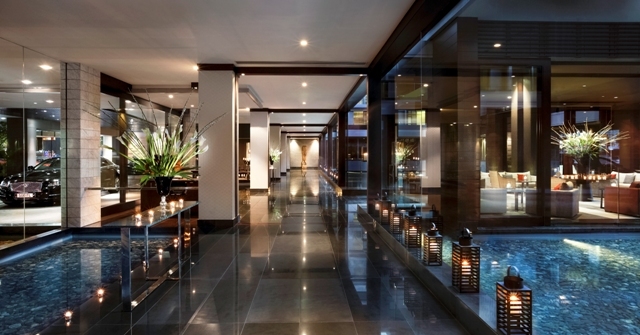 The reception is certainly welcoming, and the visual first impressions bode well too. 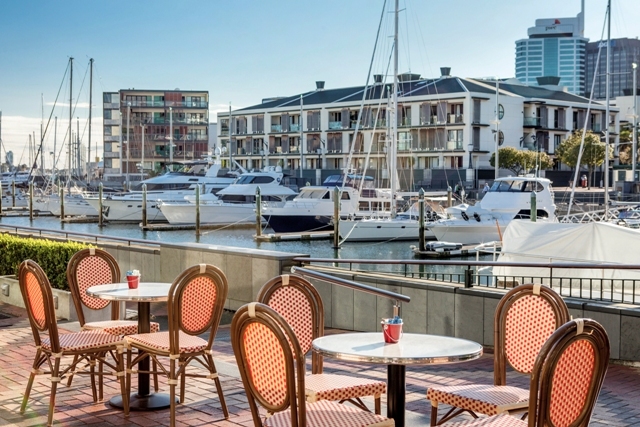 A modern 172-room five-floor five-star hotel, it’s got an enviable location on the upscale side of the city’s harbour, with cracking views of both the glistening water and the bright lights of uptown Auckland. Our Junior Suite has a Juliet balcony and has a sleek design made cosier by a velvet headboard and stylish scatter cushions on the King bed. 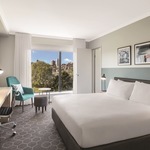 A well stocked bathroom has both a bath and shower; while wifi access is quick and easy – we can check emails while tucking into the complimentary fruit basket. 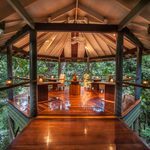 Wardrobes are well sized, so you can see how this functions for business folk as well as tourists, or even locals: this would be a fun way to spend an anniversary or birthday. Down at breakfast the next morning, we observe a variety of guests: there are some well-behaved children but it’s mostly couples and work groups. As ever, you’re best off going to breakfast early before the rush: we arrive at 7.45am and are shown to an ideal table with gorgeous views (on our second day, we sleep in and are seated on the fringes). The a la carte menu features traditional European favourites – the Eggs Benedict doesn’t disappoint. If you’re in a hurry, the buffet is more than enough: there’s a hot breakfast option as well as a good selection of cold meats, cheeses, breads, cereals and all manner of pastries, condiments and fruity side orders, as healthy or gluttonous as you require. Speaking of gluttony, there’s also bubbly if you fancy an early morning tipple. 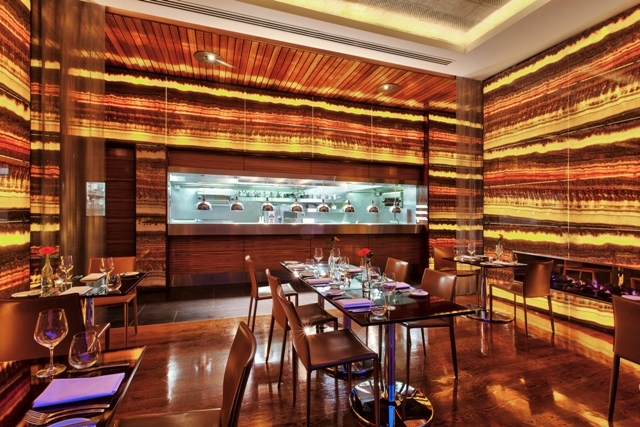 We dine in the same restaurant, Lava Dining, where at night the design really comes to life. 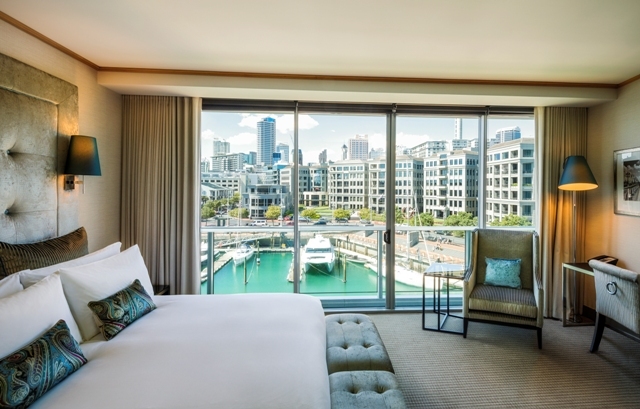 We sit by a full-length window with a spectacular view of Auckland’s famous Sky City Tower, which mingles with the glowing amber reflection of the back-lit marble wall. We opt for the tasting menu, a mix of dishes ranging from the delicate and simple to the bold and adventurous. Executive chef Sebastian Hindrichs sources local seasonal produce and adds European and Asian influences – as with many Kiwi eateries, beetroot lovers are well served, as are seafood fans. Service is attentive, wine pairings from New Zealand and France are carefully chosen. Other aspects of the hotel seem efficient: when I need to print something out, the self-service business centre proves straightforward (no extra charge). Check out is speedy, with the receipt simply emailed to me. 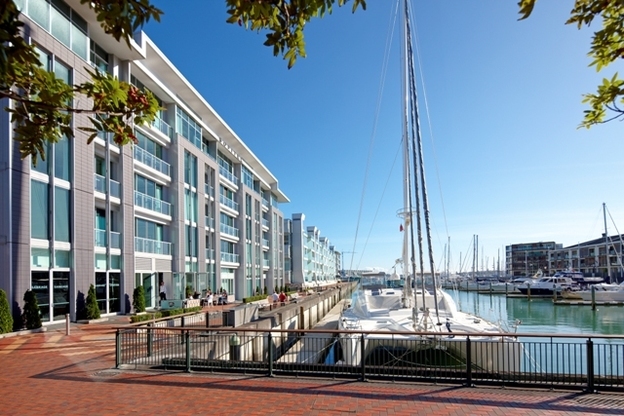 While I initially had some reservations about staying in a chain hotel, I’d definitely recommend the Sofitel Auckland Viaduct Harbour for its luxury, service cuisine and its setting, which is especially handy if you’re planning to jump on a ferry and explore the likes of Devonport and Waiheke. And when in Auckland, it’d be a crying shame not to. 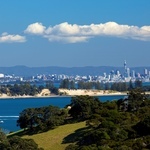 Cathay Pacific offers a choice of three routes between the UK to Hong Kong, and onwards to Auckland: fly from London Heathrow, Manchester Airport or Gatwick Airport. Economy return fares from £729, Premium economy from £2,019, Business from £3,639. Visit www.cathaypacific.co.uk or call 0208 834 8888.